The 2019 RAM 1500 let you bring your loved ones along by offering standard 5 passenger seating and a maximum 6 passenger seating. By extending the overall crew cabin length four inches, and offering inventive storage options, the all-new RAM 1500 is the most spacious cabin size yet. Featuring the largest-in-class 12 -inch touchscreen with Uconnect®, SiriusXM®, and Apple CarPlay™ the RAM keeps Lubbock drivers connected. A class-exclusive reconfigurable center console, class-exclusive under-seat storage, and rear flat-load floor provide convenient storage and organization for all your gear. 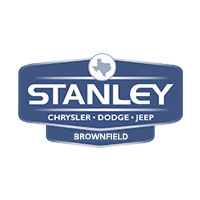 Look inside the RAM at Stanley Chrysler Dodge Jeep Ram Brownfield. The 2019 RAM 1500 has received rave reviews thanks to increased performance and an updated interior to match. With standouts like class-exclusive storage options, the largest-in-class touchscreen, and more cabin space, you are sure to find the 2019 RAM 1500 as comfortable as it is powerful. Experience the comfort and convenience of the all-new RAM 1500, decide on which cab size suits you best, and compare it to the RAM 2500- or competition like the GMC Sierra 1500– for yourself at Stanley Chrysler Dodge Jeep Ram Brownfield near Lamesa. Simply browse our available inventory and schedule a test drive for your favorite today!